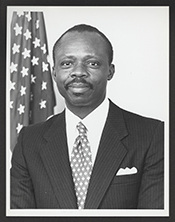 FRAZER, Victor O., a Delegate from Virgin Islands; born in Charlotte Amalie, St. Thomas, V.I., May 24, 1943; graduated Charlotte Amalie High School; B.A., Fisk University, 1964; J.D., Howard University Law School, 1971; admitted to the New York, Maryland, District of Columbia and Virgin Island bars, 1971; banking: Manufacturers Hanover Trust Company, Securtiy Trust Company; attorney, neighborhood Legal Services Program, Interstate Commerce Commission, Office of the City Attorney in Washington, D.C., U.S. Patent Office; administrative assistant and counsel to Congressman Mervyn Dymally; served as counsel to the Committee on the District of Columbia; elected as an Independent to the One Hundred Fourth Congress (January 3, 1995-January 3, 1997); unsuccessful candidate for reelection to the One Hundred Fifth Congress. Victor O. Frazer in Black Americans in Congress, 1870-2007. Prepared under the direction of the Committee on House Administration by the Office of History & Preservation, U. S. House of Representatives. Washington: Government Printing Office, 2008.